Greetings from Dallas, Texas! As we gear up for the holiday season, it's time to bring you some important updates from the DrayTek world. At the beginning of the year, I shared DrayTek's roadmap for the year with you, and I am happy to announce the progress that has been made in 2016. 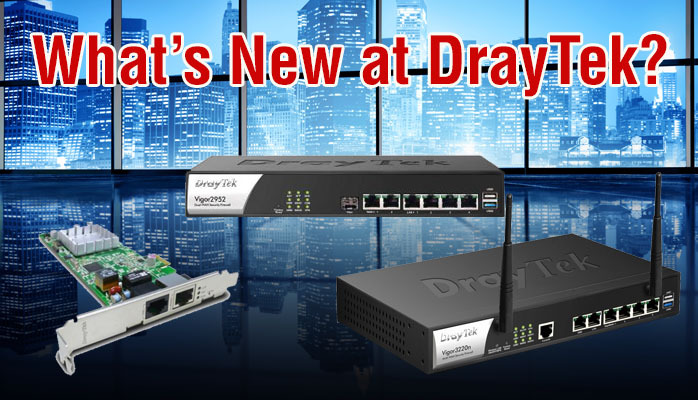 First, let me introduce you to the great new additions to the DrayTek family. For all of you who love our 2925 series, you will be excited by the new 2952 series. It's the next step up from the 2925, with better throughput; and support for 100 simultaneous VPNs as well as the ability to centrally manage up to 30 DrayTek WiFi APs for larger projects. All these features come with the same, beloved GUI and fully-loaded feature set as the 2925. We believe the 2952 will be perfect for projects such as small hotels or schools that would benefit from the built-in Wireless Controller, Multi-WAN Redundancy and Hardware Survivability. Another important addition to the DrayTek family is the VigorNIC 132 series of VDSL2 / ADSL2+ PCIe cards. These cards have a built-in DSL router and firewall; as well as a backup RJ-45 or SFP WAN port. Directly installed on your servers, they are perfect for equipping your servers, IP PBXs or software firewalls with WAN redundancy and additional security. Your servers can now have an independent VDSL / ADSL connection as backup, even if the switches, power or WAN connectivity fails in your network elsewhere. Another recent addition is the much anticipated replacement to the Multi-WAN 3200 series; the new 3220 series is also available now. Boasting four Gigabit WAN ports plus two USB ports for LTE dongle backup, this router effectively gives you six WAN connections to load-balance between, for a truly powerful and redundant solution. Last but not least, the Central Switch Management feature has just been added to the 2860 series with the firmware upgrade 3.8.4; and soon to be released 2925 firmware upgrade 3.8.4 (contact us if you wish to test the beta). Why are we so excited about this new feature? Because it allows us to manage DrayTek Gigabit PoE and non-PoE switches from a single interfce, your DrayTek router's GUI. It makes configuring VLANs on the DrayTek switches a breeze! Pair this feature with the new DrayTek G1241 24-port Websmart switches for an effortless SMB netowrk solution. Read more on Central Switch Management here. December is our month to say "Thank You!" Next year we will get a new upgraded ACS-SI 2.0 AutoConfiguration and Remote Management platform. Sign up now for a free account on our current cloud-based DrayTek ACS and get a headstart on learning about how you can offer a managed router service, with centralized monitoring and management of all your DrayTek devices.